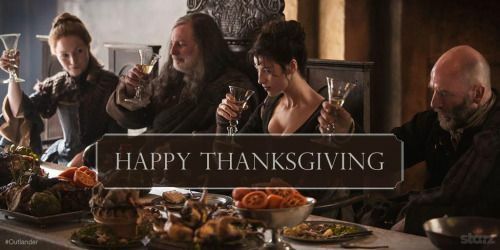 I hope all the Americans out there are having a wonderful Thanksgiving! And the non-American's are having a wonderful day! I am Thankful for all of you good people! Now off to watch Friends Thanksgiving episodes! Monica burns her first Thanksgiving dinner as the Underdog balloon gets away, Joey become a poster boy for VD, and Ross sings to his unborn child. Ross must choose between Rachel and Julie and enlists Joey and Chandler's help in making a list of the pros and cons of each. Big mistake. He chooses Rachel, but she finds the list and gets angry with Ross. Meanwhile, Monica gets a job making food with a synthetic chocolate substitute called Mockolate. Chandler agrees to spend Thanksgiving in a shipping crate as penance for kissing Kathy. Monica invites Richard's son over for Thanksgiving. Past Thanksgivings are revealed. 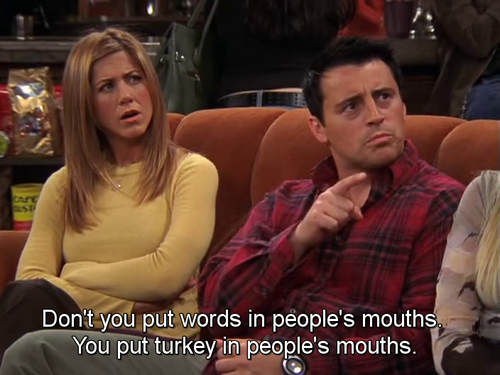 These include Chandler insulting Monica, Monica's accidental revenge, and Joey with his head stuck in a turkey. Ross is forced to tell Chandler why Jack and Judy don't like him. Rachel tries to make dessert. Joey and Ross try and get out of Thanksgiving when they are invited to hang out with Janine and her dancer friends. Phoebe sneaks a puppy into the apartment; Chandler reveals why he hates dogs. Ross becomes obsessed with naming all 50 states in order to earn his Thanksgiving dinner. Monica invites a high school friend, Will to her Thanksgiving dinner. He and Ross started a rumor about Rachel having both male and female "body parts". Joey tries to eat an entire turkey. Chandler and Phoebe avoid work. Amy, Rachel's spoiled, irresponsible sister, shows up for Thanksgiving. The gang argues over who gets custody of Emma if Ross and Rachel die. Monica and Chandler grudgingly agree to host Thanksgiving. They get angry when their friends show up late (Ross and Joey having gone to a game and Rachel and Phoebe having taken Emma to a baby beauty pageant), but their mood changes when they get good news from the adoption agency. Hope you're having a nice Thanksgiving. I really did and I too love Friends. I watch all the Thanksgiving episodes every year. Awww thanks! Happy Thanksgiving to you too!